The weather remains snowy and cold, but there are fresh things growing indoors! Sprouts are a wonderful way to introduce a fresh, healthy food to your winter diet. And certainly, if you are aiming to eat a low-carbon diet that incorporates lots of local foods, sprouts are an ideal way to continue eating fresh through the winter months. Bonus: they’re easy to grow (even brown thumbs can do it!). There is some variation in the length of time various sprout mixes will take to reach completion, but the general process is similar: soak seeds, drain and rinse daily, wait for growth to be complete, and eat! 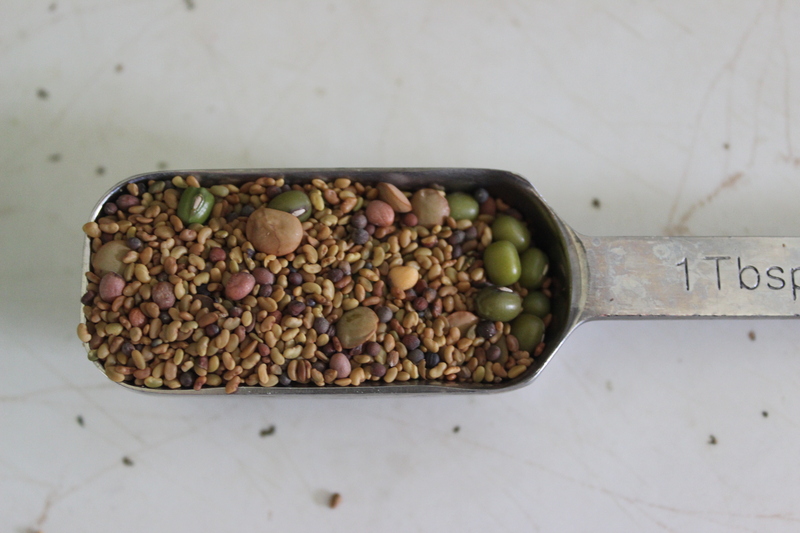 Here’s an example from my kitchen with a mix of small seeds including red clover, alfalfa, broccoli, and radish. Start with 1 Tbsp of seeds. 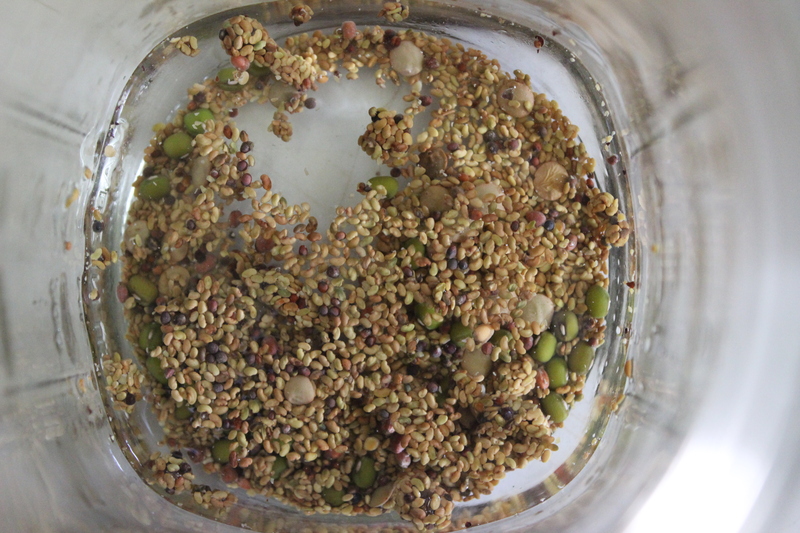 Combine seeds with 4 x more water than seeds (so 4 Tbs water in this case) in a canning jar. Cover the top with cheesecloth held in place by a rubber band, or find one of these fancy tops. (Here’s a similar one.) Soak the seeds for 2-6 hours (you’ll need more soaking time if you’re using larger seeds) and then drain. Next you’ll get into the habit of rinsing the seeds twice a day. Just give the seeds a nice bath, drain out the water, and then keep them inverted. 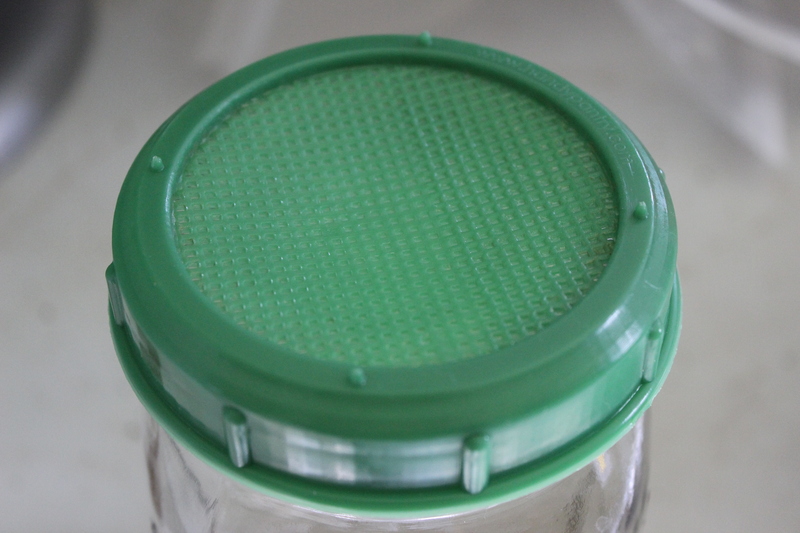 My lid has little “feet” that allow some air in if I leave the jar totally upside-down, but if you’re using cheesecloth, you’ll want to prop the jar up on its side so that excess water can drain out, but air can get in. Your seeds will start sprouting within a day or two, and then are ready to eat within 3 -6 days (it takes a bit longer in the cold). 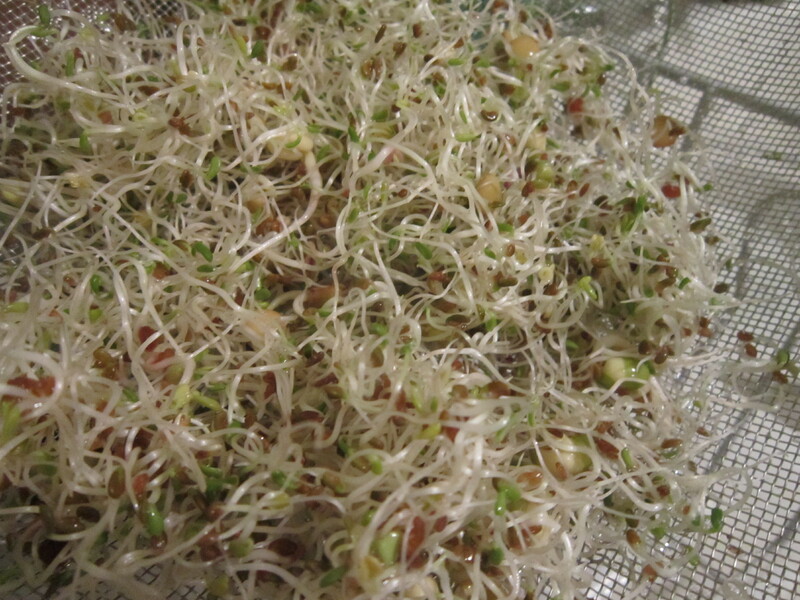 When I feel the sprouts are ready, I rinse them very well one last time (in a strainer), allow them to dry completely, and then store them in the refrigerator. I eat them on their own, with other greens, in sandwiches, or even on top of soups. If you’re looking to try sprouting but can’t find seeds locally, there are a variety of places to order sprout mixes online (such as Sprout People. They also have a lot of other sprouting gear). Just make sure to get seeds specifically meant to be sprouted to avoid risk of contamination. 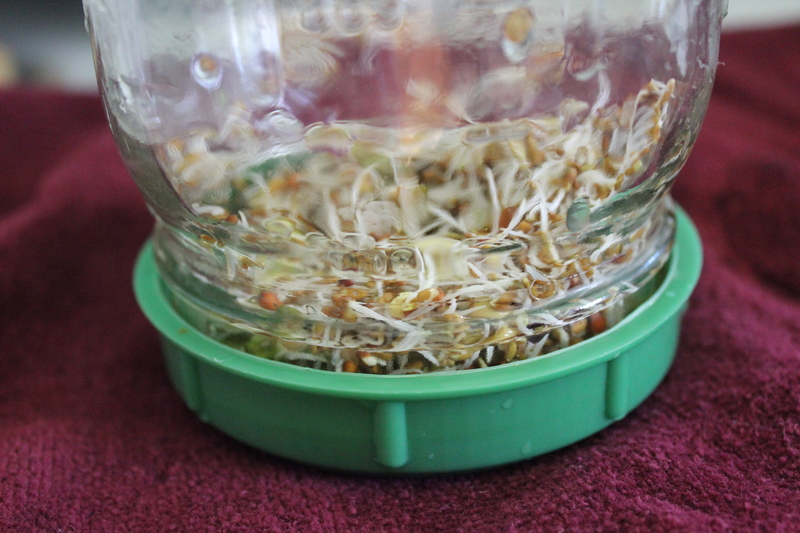 Once you start exploring sprouting, you’ll find there are many different ways to do it! Check out the Bepa’s Garden blog for a how-to on a different method. Christine, I have been following your blog for some time and I always find good things here. I have the same sprouting lids and I NEVER NOTICED the feet on them. Totally changing my spouting system – no more leaving jars in the dish drainer. Thank you, thank you for this! I have had a sprouting kit in my cupboard for over a year! It was a gift, a perfect, thoughtful gift, but I have not used it yet. I think I will be pulling it out this week. Thanks for the inspiration! Awesome! I do love sprouts on sandwiches and salads. I haven’t made my own before, but it looks pretty easy and quick! I love sprouts! Thanks so much for sharing this on The HomeAcre Hop! Ok, I’m taking the plunge-just ordered a sprouter and the French mix! Nicely done!! I hope you enjoy it!